The festival kicks off on Friday night in the ReAnimate tent with the Blue Ball, and features 15 live bands throughout the weekend. Bredo’s Brew by Grossenbart Brewery, craft beer and cocktails at the Ice Bar; Grandpa’s Gear Shop, and vendors. Formerly known as the “Brain Freeze” tent and located on 1st Street in downtown Nederland (see the map), the NYD tent showcases local artists, crafty types and outstanding musicians. Craft beer from Upslope Brewery; locally-distilled spirits; 12 live bands; live painting. Open Saturday and Sunday. 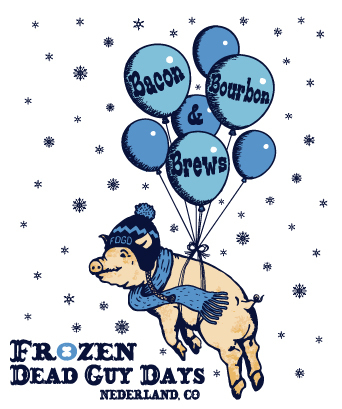 Lotsa Bacon, lotsa Colorado craft brew, a bit o’ Bourbon and a TON of FUN. The 3B tent, open on Saturday and Sunday, is now located in Guercio Field next to the ReAnimate tent (see the map). Featuring 12 live bands.